This 4-hour workshop focuses on Student Selection, Preparation, Code of Conduct and Returning Support (Standards 4 and 5) and will help you to identify resources and design programming to assist in this effort. Time will be devoted to the presentation and explanation of a comprehensive judicial screening process. Participants will critically examine different preparation and returning support models and will develop strategies to improve upon them so that they might be useful in their specific context. 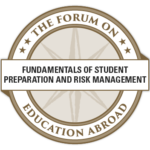 This qualifies as a Forum Certification Workshop and part of the Fundamentals of Student Preparation and Risk Management Competency Credential. 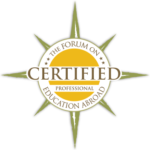 This workshop is associated with the Fundamentals of Student Preparation and Risk Management Competency Credential and Module 6 of the Professional Certification in Education Abroad Program. A group discount ($20/person) is offered to four or more paying workshop attendees from the same member institution/organization. This workshop is offered in collaboration with AAPLAC: the Association of Academic Programs in Latin America and the Caribbean, an organization which facilitates and supports study abroad programming among Latin American, Caribbean, and U.S. institutions of higher learning and organizations dedicated to the promotion of cross-cultural, academic-based experiences. Established 30 years ago, AAPLAC will be hosting its 30th annual conference at the Universidad Autonóma de Yucatán in Mérida, México, February 20-24, 2019 immediately following the Forum Workshop. Forum workshop attendees are welcomed to register and participate in this year’s conference panels and events. Visit the AAPLAC website for more information about the 2019 conference and registration.